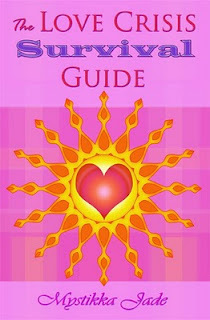 The Love Crisis Survival Guide is written as a spiritual yet practical approach to self-empowerment in the relationship process. Some parts of this book may feel a bit uncomfortable to read, because I don’t sugarcoat information that could be perceived by many as bitter. I will always encourage you to take responsibility for the reality that you create. I have come to understand a great deal about relationship crisis resolution as a result of my experience counseling many thousands of people as a professional psychic since 1993. Although my job dwells outside the lines of what appears “normal” to mainstream society, it has allowed me to tap into the core of humanity - the most interconnected area of the human psyche and condition. I feel I must start off by addressing the fact that, ‘WHEN’ is truly a four-letter word of the worst kind when it comes to getting readings. Psychic energy comes from a non-linear place, outside of the space-time continuum. We as people have the free will to make choices and take actions that can alter the time it takes for a situation or event to transpire. Therefore, it is my opinion that psychics are not able to provide consistent, accurate timeframes for their predictions. Many people call psychic readers for a ‘fix’ of hope when they are not getting it directly from their love interest. When a client feels emotionally neglected by someone significant, the psychic can appear to be the best candidate to assure them that they are loved by the object of their affection, or that the ex boyfriend or girlfriend is coming back. Many clients develop an addiction to psychic readings, hoping that the information revealed will calm their tumultuous emotions or fill the proverbial hole in their hearts. The sense of peace obtained by the client usually fades very quickly when doubt starts to kick in again shortly after a reading. They seek further solace by getting more readings. In extreme cases, clients may call psychics several times a day, even if they have accumulated many thousands of dollars in debt. These clients end up losing more than just vital amounts of money in their quest for privileged information. They also end up with so many different opinions circulating around in their heads as a result of all the different psychic readings they have received, that it becomes increasingly difficult to be at peace with themselves long enough to discern the inner voice of their own intuition. Most psychics that I know personally only want to see the client succeed and find happiness in their lives. Granted, there are always deceptive and manipulative bad seeds in the bunch that give the rest of the psychic community a bad name. Psychics who have integrity are still only able to actually help clients who are willing to remain teachable. Psychic consultations can be used as a powerful tool if they are obtained with enlightened intentions by a seeker who understands the limitations of a reading. However, there is a common misconception in this society that the purpose of a psychic is simply to predict the future in the way of fortune telling. While genuine psychics can see the short-term outcome of some situations that have already been set in motion, we are not able to see forward and backward through time as if we were omnipresent. Common ground between me and other readers I respect is that we strive to help the client stretch the understanding of their role in the creation of their lives. In fact, many successful spiritually based psychics that I know make it a point to educate their clients about the fact that predictions are unreliable. Our futures are not set in stone, because the universe allows us to alter the course of our lives with the power of our thoughts, decisions and actions. Psychics who are spiritually inclined have an ability to rise above the petty aspects of life and see pieces of a greater picture, or a ‘Grand Design.’ We are sensitive to the directions that someone’s personal life path may take based on the decisions they have made and are currently making. We see and feel patterns in people’s lives that may restrict their potential success, and we have an awareness of how to help the client obliterate them. While therapists generally get their knowledge from textbooks, spiritual psychics receive information from ‘the other side,’ ‘spirit guides,’ ‘the source’ or ‘the light.’ Psychics can tap into their gifts naturally, and also through meditation and psychic development techniques. Some psychics excel with the aid of divination tools like the tarot, runes, the I Ching, palmistry, numerology, tea leaves or astrology. Other readers prefer to use their empathic or clairvoyant skills when conducting sessions. Each psychic has their own style when it comes to deciphering and delivering his or her readings. Psychic abilities are no different than gut instincts; a sixth sense, discernment, mother’s intuition, or any other more generic term that describes an inner knowing that transcends logic. However, just because everyone has the potential to give and receive psychic energy does not mean that they can often interpret the vibrations accurately, or that they have the gift of being able to communicate in a way that can relay the information to others in a helpful manner. Please ‘take what you want and leave the rest’ in terms of what I write here. I cannot be held responsible for the use or misuse of the information I provide.